It’s just the 25th of July and we’ve experienced a sudden drop of temperature here in New Jersey. Can you believe the highest my place reached is 72F? Call me crazy but we still managed to attend the 45 minute swim lessons this morning. Talk about dedicated students! 1. Leftover homemade roasted chicken or even a store bought rotisserie chicken. If you are not making your own, just make sure that it is gluten free or is food allergy friendly as it may contain seasonings that can be allergen to some. 2. Chicken stock adds plenty of flavor even if it is diluted in water. By having more water, I was able to keep the recipe as budget friendly as possible. Isn’t that great? 3. The chicken bones that were added to the soup during simmering also gives an extra boost of chicken flavor. So please, do put it in. Just don’t forget to remove it before serving. You will also notice that I didn’t pre-cook the pasta. Since I was using a gluten free version that tends to easily deteriorate, I decided to just let it cook in the soup. The starch that the pasta release during cooking, also thickens it. Thus, there is a silky texture. 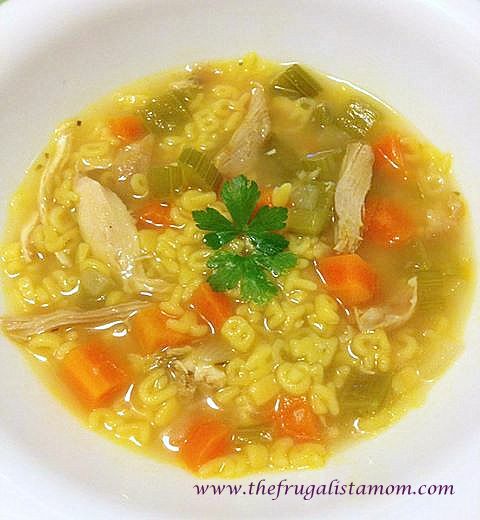 So, if you are craving for some homemade soup and is short in time, keep this recipe handy. The ingredients are simple and readily available. Even the pickiest kid will give this a thumbs up. 1. Prepare the chicken by removing the skin and meat from the bones. Discard the skin but keep the big bones and shredded meat. 2. In a big soup pan, heat the oil and sauté the garlic, onions, carrots and celery for about 5 minutes. 3. Pour in the chicken stock and water. 4. Add the chicken meat and bones. Make sure the bones the big enough to be easily removed later. 6. Once the soup is boiling, season with the rosemary, ground black pepper and 2 tsp. sea salt. 7. Simmer for at least 10 minutes. 8. Taste. Depending on the chicken stock you used, you may not need to use all of the remaining 2 tsp. of salt. Since the brand I used is low sodium, I have to use all of the salt. 9. Bring to a boil again. 10. When it starts to boil, add the pasta and let it cook for about 8 minutes or until the pasta reached your preferred texture. Keep stirring so that the pasta doesn’t stick to each other. Make sure not to over cook the pasta. The hot soup will continually cook the pasta even if the heat is already off. 12. Remove the bones before serving.